Norden Maritim AS has delivered high quality products to customers since 1997. ​​Market leading companies are choosing our products due to our cost efficient and high quality solutions. Combine this with our technical knowledge, and our customers receive a trustworthy and flexible service required in todays fast pace market. Norden Marine Bearings AS was established in 2017. The company's core focus is products and systems for the shipbuilding market. We strive to give our clients an experience of quality and competence throughout the dealing with us. During design and solution phase we focus on giving value adding advice to our clients, often originating from our years of experience from different projects. Commercial offerings are backed by technical calculations, drawings, 3D models and analysis. Our contract managers keep in close contact with our clients throughout the project phase, with emphasis on delivery quality and timeliness. Our trained engineers are available for field installation and commissioning support, which at the end is documented by a written photo documented report. 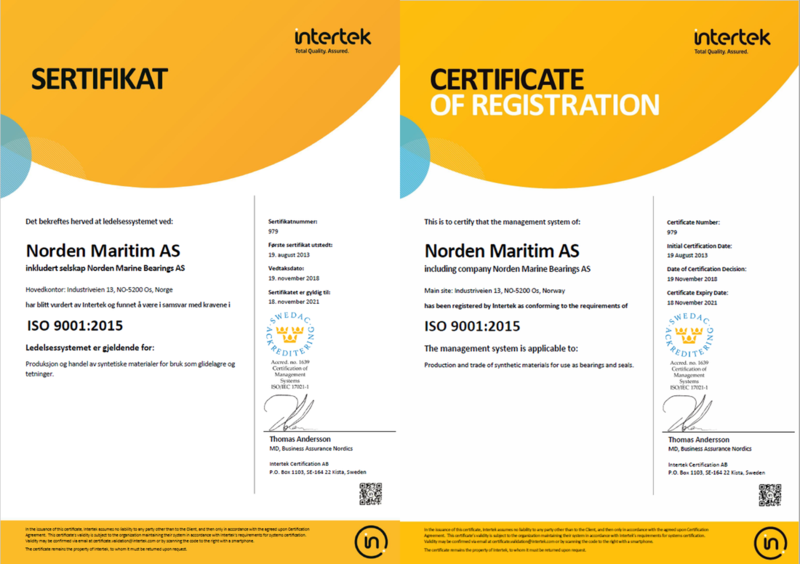 Norden Maritim and Norden Marine Bearings hold ISO 9001:2015 certification. All our processes are governed by our quality management system, and full project traceability is available for supplied products. Several clients have performed audits of our company over the years. We value clients audits as these give us a chance to further improve our quality assurance procedures, and at the same time learn best practises from around the world.